Go mobile with our app! Join the fun while challenging yourself against other riders to test your memory skills. Prizes will be awarded to the participants who have the best and least memories. 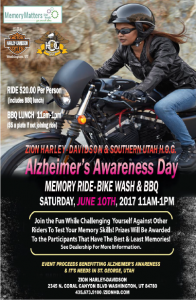 Event will includes a memory ride, bike wash, and BBQ. 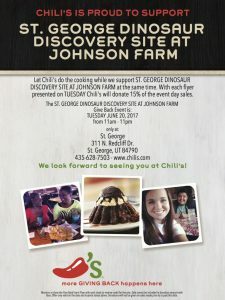 The local Chili’s is giving back to the St. George Dinosaur Discovery Site at Johnson Farm on June 20, 2017. Present the flyer attached here and 15 percent of the day’s sales will go to us. The fun begins Friday at 6pm. All of the regular portions of the event will be in full swing but rather than stop at 10pm–this month it goes until midnight and brings a host of additional activities, such as the Galaxy Light Parade on Tabernacle at 9:15, the Moonlight Downtown 5K at 10, and finally the Firehose Foam Frenzy Party at the Main Street Stage at 11. The Downtown Farmers Market at Ancestor Square features a variety of vendors selling seasonal produce such as fruits and vegetables, free range beef, pork, and lamb, cheeses such as goat, feta, gouda and cheddar, free range organic eggs, local honey, granola, live plants, herbs, fabric goods, soaps & lotions, jewelry, woodwork, hot coffee, pastries and more. Anything and everything homegrown, homemade and/or locally produced. SUPPORT LOCAL FIRST! 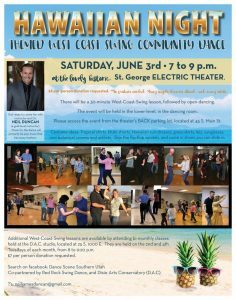 Come have a blast at the west-coast-swing community dance held at the Electric Theater. There will be a 30 min lesson followed by open dancing. Come dressed up, but make sure you wear shoes you can dance in! $8 donation per person requested. No partner required. 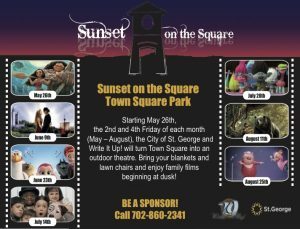 The FREE family-based community event features movies under the stars in the heart of St. George at Town Square Park. Every event features booths, food, face painting, lots of prizes and of course, dancing – all before the movie starts!! Every 2nd and 4th Friday of the month May 26 – Aug. 25 will feature exciting themes and lots of extras our fans love! Don’t worry if you don’t know how to dance. There are lessons held just before the dance. Dancing styles: Lindyhop, Balboa, Charleston, etc. Cost: $5 per person (add. $1 for the lesson). Cash only. 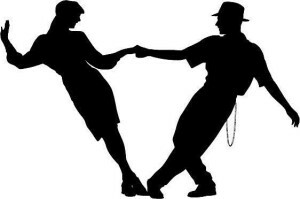 Lesson is from 7:30-8:30 pm (beginning and intermediate), and the Open-dancing is from 8:30-10:30 pm. No experience or partner required. Beat the heat this summer with Precision Hearing and Memory Matters. 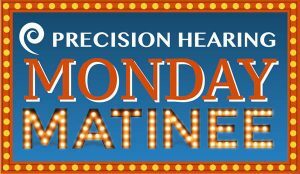 The Precision Hearing Monday Matinee series is a new, FREE community event presented at The Electric Theater right in the heart of St. George!! All proceeds and donations will support vital, local Memory Matters’ programs. For a complete schedule of all the shows this month, be sure to check out the calendar! 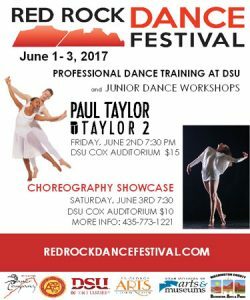 The Red Rock Dance Festival is an eclectic three-day workshop festival that includes master classes and workshops by Paul Taylor 2, seminars taught by renowned dance scholars and university dance professors, a dance performance by Paul Taylor 2, and the annual choreography showcase with works presented by emerging choreographers. Kids and teens are instructed in a way that encourages self-expression and gives them the tools to be independent, confident and competent artist. 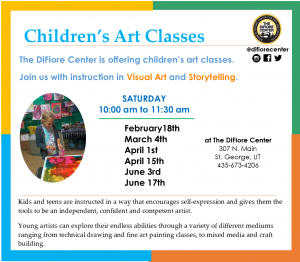 Young artists can explore their endless abilities through a variety of different mediums ranging from technical drawing and fine art painting classes, to mixed media and craft building. 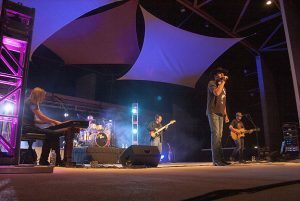 Come and enjoy Utah’s own, Eric Dodge and Ryan Shupe, as they perform their original country tunes on the stunning Tanner Amphitheater stage. Joining Eric and Ryan will be line dancing instructor extraordinaire, Miss Vickie. 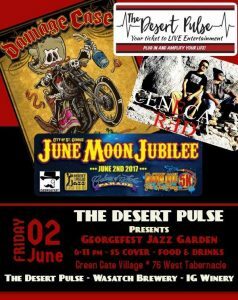 It will be an entertaining evening of music and dance for the whole family. 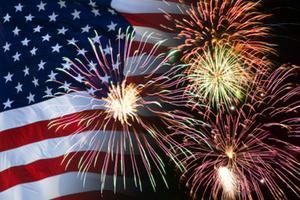 The celebration on July 4th grows every year! Come help make it possible by volunteering to run a game, help host a contest (pie eating, rootbeer, etc.) happening all day, or oversee the bounce houses downtown. Volunteers are needed to help assist checking clients in, stocking shelves, unloading food trucks, etc. 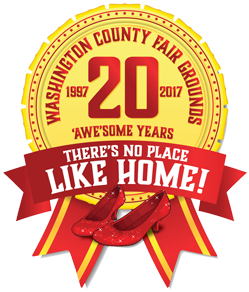 Judges will be judging quilts, handwork, foods, canning, crafts, and youth projects. You do not need to be a professional, just willing and some knowledge. Neighborhood Connection is looking to collect food donations for non-perishable items like tuna fish and granola bars to be able to help feed kids. 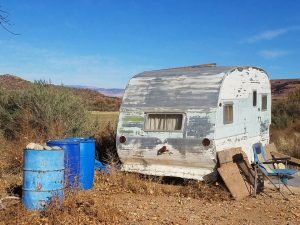 WASHINGTON CITY — Every day when Charlie Brown drove by a rundown trailer sitting on a desolate plot of land on Washington Dam Road he wondered if somebody lived there. Then the day came when his curiosity got the best of him and he decided to stop and find out. ST GEORGE UT – DOVE Center’s Board of Trustees is pleased to announce that effective immediately, DOVE Center has assumed ownership of Erin Kimball Memorial Foundation. ST. GEORGE UT – We are excited to announce the launch of Neighborhood Connection, a new nonprofit that focuses on bringing food to children in need. Their program sends 2 breakfasts and 2 lunches home with children on the free lunch program so that they have adequate food during the weekend. 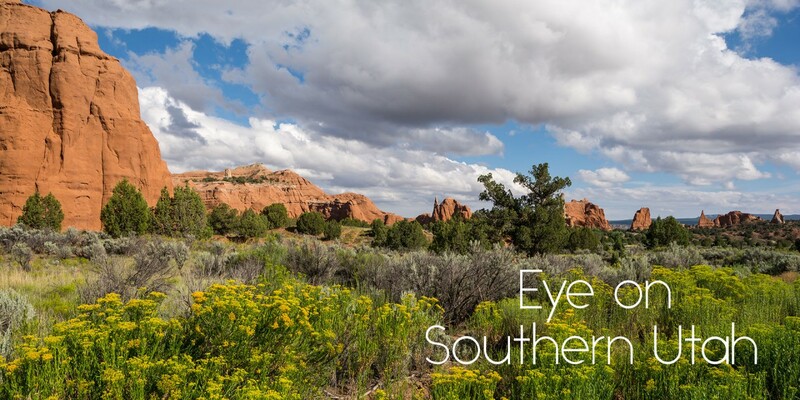 Join the newsletter for the easiest way to stay up to date on what’s going on in Southern Utah.